Job opportunities continue to skyrocket for computer technicians. Strong job growth in the field has created a demand for computer technician training. As with many information technology jobs, a large part of the work is technically-based, so knowledge of computers and computer systems is a must. 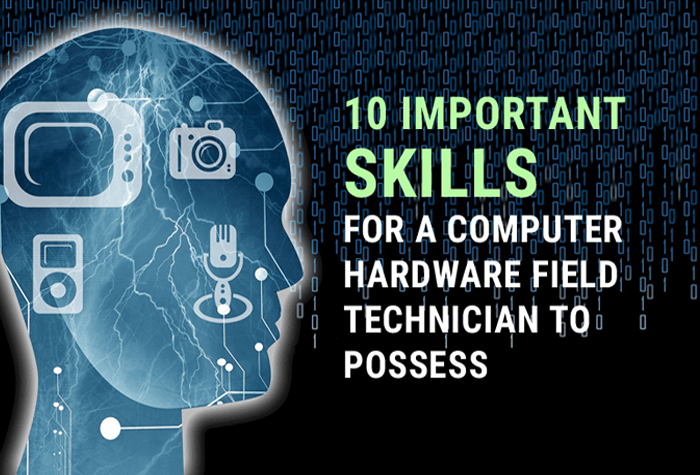 However, there are many other skills a computer hardware field technician might want to possess. Interacting with computers. Using a computer or computing system for a computer hardware field technician means speaking the machine’s language. Be sure you understand how computers interact with humans and learn to match your thinking to the machine. Collecting data and information. Being a computer hardware field technician is not unlike being a private eye. Much of your job involves diagnosing and repairing a problem; this task has a lot in common with solving a mystery. A big part of that job involves collecting as much pertinent information as possible in order to diagnose the problem. Problem-solving and decision-making. Problem-solving is vital to being a computer hardware field technician. Connecting the dots to determine the problem and then deciding the correct course of action to take in order to solve the problem is a very important part of the job. Communication. Communication is a key skill in almost any job. Every day we communicate with others, whether it’s face to face, on the phone, or via email or instant message. A computer hardware field technician must be able to communicate effectively with clients and co-workers to share information and solve the problems that arise in their everyday life. Consulting and advising others. A computer hardware field technician often ends up advising others on a variety of tasks. A good field technician is able to foresee the outcomes and effects of various IT strategies and advise management as to the best course of action accordingly. Inspecting equipment, structures or material. A computer hardware field technician must ensure that the equipment is operating properly within its environment. In order to determine what is not working properly, a technician must have a firm understanding of the equipment and all its components and how they work together to perform properly. This will help the computer hardware field technician narrow down the options when troubleshooting. Documenting and recording information. There are baseline metrics that computer hardware field technicians must keep track of in order to properly diagnose a healthy network or computer system. This information is essential to ensuring the system is running properly. It is important that technicians monitor the efficiency of computer hardware and make adjustments if the system is running slowly. Developing objectives and strategies. In order to create a smooth working network, a good IT technician must maintain a proactive strategy that involves maintenance, frequent virus scans, and creating safeguards. These activities will help to prevent any major issues or problems. Training and teaching others. There are two main tiers of training for a computer hardware field technician. The first is creating a best-practices environment by offering continual training that keeps staff members up-to-date on new developments in the IT field. The other is training users on how to correct or prevent any problems or issues that may arise. Repairing and maintaining electronic equipment. A computer hardware field technician’s main job is in the maintenance and repair of electronic equipment. Computer systems, including desktop PCs, laptops, and mobile devices are all complex pieces of machinery, and the computer hardware field technician must know how to correct issues with them, repair them when they break down and perform maintenance on them to prevent them from breaking down.